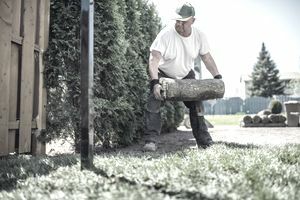 If you’re a homeowner, landscaping might consume a significant portion of your budget during the spring and summer months. It’s not necessarily one of those expenses that people think about very often, either. Many people overlook this expense entirely when they are creating their monthly or annual budget. I’ve seen many written budgets that don’t have any line items dedicated to landscaping. Of course, if you live in a condo, apartment, or townhome, you don’t need to worry about this expense (though you do need to worry about paying HOA dues). But if you’re a homeowner, particularly a first-time homeowner, you may not yet have a solid understanding of just how much exterior home expenses can add up. Planting, fertilizing, mowing and maintaining your grass, cleaning your gutters, pulling weeds, mulching, and aerating can pile up quickly. Even if you pay for xeriscaping in order get rid of grass, you still have a yard to maintain. Native vegetation needs to be weeded and cleaned weekly or biweekly. The cost of yard care can make up a considerable portion of your budget. Here are a few ways you can offset the cost of maintaining your yard and plan for these expenses. Rather than purchase dirt compost and mulch from a big box store, look for sources that give it away for free. Many cities, counties, and municipalities have excess dirt they’re willing to give away to their residents. There’s often a particular pickup time (like Tuesday from 7 to 9) when ordinary citizens can just go pick up dirt and mulch from a municipal center. You can also check Craigslist for homeowners who have extra dirt they want to get rid of. This is a win-win situation for both parties. Those homeowners won’t need to pay for a dumpster rental to dispose of their dirt, and you get to walk away with free excess dirt. If you aren’t familiar with the practice of xeriscaping, it involves getting rid of your grass in exchange for having a yard that consists of native rocks and vegetation. It has grown in popularity due to its environmental cleanliness. However, many who promote xeriscaping claim that it’s also more budget-friendly. This may or may not be the case depending on where you live. Paying a company to xeriscape your yard might cost $5,000 to $10,000. If you decide to do it yourself, it will cost you multiple weekends of your life. That’s not "free" – it represents precious time being taken away from building your side business or doing other important tasks. Plus, it will still cost a few thousand dollars in materials. In addition to that, xeriscaping is not the same as " zero caping." You’ll still have to maintain your yard on a regular basis. If you live in a humid area where weeds are prone to growing, you may have to go pull them from between rocks once or twice a week. This can take several hours of your time – one hour of pulling weeds, twice a week, adds up to 8 hours every month. If you don’t have an extra eight hours per month to spare, you’ll have to hire somebody to do it. This entire process might be more expensive than simply hiring somebody to mow your lawn. That’s not to say that xeriscaping is always the more expensive option. If you live in a desert climate like Arizona, Colorado, or Nevada, it’s possible xeriscaping may be the more budget-friendly choice. The bottom line here is to not make any assumptions one way or the other. You should actually do the math. Sit down, create a spreadsheet, and figure out whether mowing or xeriscaping your yard is the more cost-effective solution. It’s far too simplistic to paint one option or the other with a giant one-size-fits-all brush. If you already hire a company to regularly clear your gutters or mow your lawn, you may be able to get a discount for being a recurring customer. Many companies offer regular weekly or monthly treatments at a lower price than they would offer a one-off level of service. If you’re planning on using a particular company regularly, it doesn’t hurt to ask for a discount. The worst they can say is no. If you hire a lawn mowing company, you may notice they charge extra for edging. This means they take particular care around the edges and corners where grass grows because it can’t be reached with a lawnmower. You may be able to avoid this fee by planting around those edges. Pick some type of plant that is hardy year round and can be grazed with a lawnmower without serious injury. Take Mondo grass as an example. It’s a great candidate for edging as it’s an ornamental grass that looks great all year. If a portion of it is hit with a lawnmower, it won’t harm the plants. By spending an extra hundred or two planting with Mondo grass upfront, you might be able to save yourself $10 a week on edging. The investment will quickly pay for itself. You may need to water a little to prevent your grass from turning brown and dying, but you don’t need the greenest, most lush lawn in the neighborhood. Watering less frequently helps you save money on your water bill, and it’s environmentally friendly. That sounds like a win-win. Figure out how infrequently you need to water to achieve a result you’re satisfied with. This is sometimes known as the “minimum effective dose.” You’re not going for the perfect lawn here; you’re just going for one that’s good enough. If you have children old enough to take care of the lawn, offer to pay them to do it instead of paying a company. You can teach your kids about work and money management, and you’ll probably save more by having them take care of it versus a company. Plus, your kids can use that money to pay for their own discretionary expenses like clothing or music. That can even further reduce your budget.